Pakistan's Shari'a Pact: Giving In to the Taliban? Will Pakistan Arrests Ease Terrorism Tensions with India? In a desperate move to deal with an intractable radical insurgency, the Pakistan government said it will impose a form of Islamic law in the Swat Valley, located in the northwestern corner of the country. As a result, Islamabad's faltering military campaign there has been put on hold, and the militants have agreed to a tentative cease-fire. But many observers fear that, far from calming the conflict, the government has capitulated to the Islamist guerrillas and set a worrying precedent  one that will surely displease the U.S. officials who want the Pakistani government to take a harder line against militants. Speaking at a news conference in Peshawar, Amir Haider Khan Hoti, the chief minister of the North-West Frontier Province, said on Monday that Shari'a law would be introduced to the Malakand division (which includes the Swat Valley), but only once the area is peaceful. The Taliban tentatively welcomed the decision, announcing a 10-day cease-fire on Sunday. According to the terms of the agreement, "all non-Shari'a laws" have been abrogated in Malakand. Security forces "will only act if fired upon by militants." And if the "writ of the state is restored," the army's 12,000 troops will be withdrawn from the valley. The agreement, which enjoys the support of President Asif Ali Zardari and the army, came about after talks with Islamist leader Sufi Mohammed  Fazlullah's father-in-law and rival. 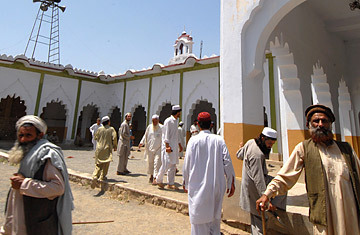 Government officials argue that by imposing Shari'a law, Islamabad is merely bowing to what is a popular local demand. The Swat Valley was traditionally a princely state that operated its own tribal system of governance until its merger with Pakistan in 1969. One of the factors that appears to have contributed to Fazlullah's ascent was his call for a return to a Shari'a-based system that offers swift justice and, therefore, relief from what many allege is Pakistan's venal police and court system. By stealing a march on Fazlullah, the government believes that it can now stear supporters away from the jihadist, isolate the militants and, with Mohammed's help, restore peace. It is, however, a highly controversial and risky course. A previous peace deal failed within months  and gave the militants the space to regroup and sweep away earlier military gains. "It is an attempt on the part of the government to win over a section of religious extremists," says Hasan Askari-Rizvi, a military analyst. "The idea is that if they are pulled out of the struggle, they will cooperate with the government and help isolate the militants. It may have been a good idea if the Taliban were on the run, but they're well entrenched." It is unclear what Mohammed's precise role will be, or how much leverage he has in Swat. The militant leader emerged as a force in the mid-1990s, when his loyalists, sporting black turbans, seized control of buildings and courthouses before the government of then Prime Minister Benazir Bhutto was able to tame the revolt and sign a truce. In late 2001, Mohammed led thousands of young men  including Fazlullah  to Afghanistan to fight the Western forces that had invaded in the wake of the 9/11 attacks. Upon their return, Mohammed was arrested and imprisoned. His release last year was contingent on his disavowal of militancy and an agreement to cooperate with the government. Equally murky are the details of how the new legal system will operate. Other countries provide little guidance in the co-existence of Shari'a and civil law. Iran and Saudi Arabia operate under religious law; Shari'a is applied in limited range among the Muslim populations in India and the Philippines. Previous laws in Pakistan that were never enforced allowed Muslim clerics to advise judges on cases. Government officials insist that the ban on female education will be lifted and that the measures will be less austere than the Taliban's in Afghanistan. But Pakistani advocates of women's rights have sounded an alarm, forcefully arguing that the move endangers both the rule of law and women's rights. "We condemn it," says Iqbal Haider, co-chairman of the Pakistan Human Rights Commission and a former law minister. "It is an illegal, unconstitutional and discriminatory act to further promote religious fanaticism in Pakistan. The constitution does not allow a parallel legal system. And there is no guarantee of peace  the militants are not party to it." "It's going to be hard to reverse," laments Afiya Shehrbano, a leading women's rights activist and writer. "It's sanctioned by the President and the center, and sealed with a clause that says that it cannot be challenged in the Supreme Court. That's a violation of the constitution. It also shows that if movements are armed and militant, you can succeed." Her fears were reinforced on Sunday night, when Muslim Khan, Fazlullah's spokesman, said that it remains the Taliban's ambition to establish their brand of Islamic law not just in Swat but throughout the world.